“Who’s ready for lunch?” asks Lex Frieden, his tone clear, a wry grin gracing his boyish face. He bears all the marks of a man accustomed to taking the lead. "What do we want, Italian food or Mexican?" he asks, hiding his preference for the latter. "Italian," says Joyce, his wife of 26 years. "Italian," echoes Mac Brodie, their housemate and Lex's almost constant companion since the early ‘70’s. Outvoted, Lex plays at disappointment, but in the blink of an eye, all are out the door and headed for the van. Lex and Joyce require motorized wheelchairs; Mac needs help remembering where they are going. Where one is lacking, the other fills in, enabling them to live together. [Photo Caption] Joyce and Lex eloped in a quiet ceremony in front of the Jefferson Memorial in Washington. D.C. Forming a triangle, the three of them are a family and friends, fully committed to one another. Where one is lacking, the other fills in, enabling them to live together, independent of outside care. Joyce does the driving, shopping, and a host of other chores. Mac serves as Lex's arms and legs, assisting with his hygiene, helping him get dressed, even simply holding a drink to his lips during meals. Meanwhile, Lex functions as Mac's memory, his aide in processing information, staying organized, making decisions and dealing with finances. Lex, now 54, was a brilliant freshman at Oklahoma State University, full of promise and hope. During Thanksgiving weekend in 1967, he and a carload of pals were out for a ride when another car struck theirs head-on. His friends all climbed out of the wreckage relatively unscathed. When Lex tried to follow, he couldn't move. His neck was broken at the fifth vertebra, and he has since had no use of his lower body, no grip in his hands, and only limited use of his arms. Joyce was struck by a rare disease during the early 1970s. A single mom at the time, she was diagnosed with encephalomeningiomyelitis. It was like having three life-threatening diseases at the same time—each attacking the central and peripheral nervous systems. While preparing for her own death, Joyce begged her parents to adopt her daughter, Melissa, nearly 2, and they tearfully agreed. Weeks later, Joyce miraculously recovered, but was left paralyzed from the waist down. She spent one year in a rehabilitation facility, then another year learning to live independently, while Melissa stayed with her parents. Mac suffered a brain injury in the late '60s when, as a Navy corpsman, his squad encountered a land mine while on patrol in Vietnam. Mac was slammed against a tree, hitting his head, and the impact affected his ability to think and make decisions and his recall. Although he appears quite normal today, with the body and strength of a well-conditioned man in his mid 50s, he often occupies himself by sitting quietly in a corner, drawing cartoon characters. As they head toward lunch, Joyce leads the way. Using a magnetic switch, she opens the double doors at the rear of their specially equipped van, lowers a lift and wheels herself inside. Mac similarly assists Lex, securing his chair with special straps as Joyce hoists herself into the driver's seat. Using a single hand lever to accelerate and brake, Joyce maneuvers through the infamous congestion of Houston traffic with practiced ease. Soon she pulls up to a restaurant they frequent, and the loading procedure is reversed. Within moments everyone is seated inside, menus in hand. The entire process seems so easy. And it is, relatively speaking—but not by chance. The Americans with Disabilities Act, signed into law in 1990, has a lot to do with that "relative ease." And Lex Frieden had a lot to do with that legislation. As executive director of the Na­tional Council on Disability in the mid-1980s, Lex and his staff developed a proposal that became the founda­tion for the ADA, the first civil rights law to protect the disabled against discrimination in employment, public accommodations, transportation and more. "Reasonable accommodation," says Lex. "In the final assessment, those were the key words in making that legislation work. We tried to define the requirements that businesses would need to meet, while not creating a hardship on those businesses." Once that reality neared, Lex was free to pursue his other passion: developing a formula for disabled people to live independently, and then teaching that formula through his association with a group called Independent Living Research Utilization. He, Joyce and Mac are a prime example of just how it can happen. They are the definition of symbiosis—an interaction between dissimilar organisms living physically close, especially one in which each benefits the other. "We couldn't live this way without Mac," says Lex, "and he couldn't live this way without us. The arrangement is mutually beneficial, and we each have vastly improved lifestyles as a result." Lex and Mac first teamed up in 1972. Lex was living at an experimental housing annex sponsored by The Institute for Rehabilitation and Research (TIRR), located in the renowned Texas Medical Center in Houston. Residing in a nearby home for the mentally retarded, Mac volunteered to assist residents at the annex. The two men established a bond right away, but it was Mac's mother who suggested they might be able to live on their own if they pooled their abilities. A third man, one who could drive, joined them, and they soon rented a house together. A couple of years later Lex met Joyce while both were attending the University of Houston, he in graduate studies, she as an undergraduate. Joyce attended a rally he was hosting for the disabled, in order to build a coalition of local organizations involved with the issue. She later visited his home to help type bylaws for the coalition. That night, when a rainstorm caused a flash flood, Lex suggested she stay over rather than get soaked. A few months later she moved into the guest bedroom, and two years later she and Lex eloped. 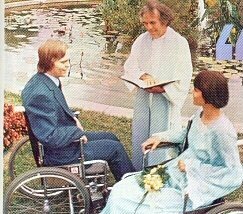 Their wedding ceremony in 1977 was held in front of the Jefferson Memorial in Washington, D.C.
Joyce initially thought she would find a partner who was not disabled, who could help her counter the practical limitations of requiring a wheelchair. "But I've always been attracted to brains," she says. "I figured between the two of us, we could figure out a way around any problem." Joyce and Lex have become the legal guardians for Joyce's grandson, Trey O'Connor, now 12. "Melissa and her husband were going through extreme difficulties,” says Joyce, "and Trey needed a stable environment. [Trey has attention deficit hyperactivity disorder.] It worked out well for everyone, and both his parents are again involved in his life." "We want the same opportunities enjoyed by everyone else," Lex says. 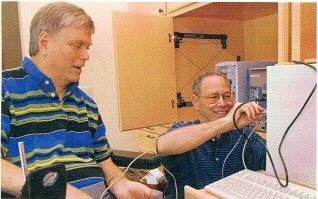 [Photo Caption] For nearly 30 years Lex and Mac have lived together independently by drawing on each other's strengths. "Trey adds energy to our mix," Lex says. "We're always going to a soccer game, or a basketball game, or a pizza joint. Like everyone else, we pile into the van and take off." Not that there was ever a lack of energy. Lex and Joyce have traveled extensively since marrying, both for pleasure and also to meet with leaders, presidents and royalty around the globe in an effort to further their cause. Mac, of course, goes where they go. As for Trey, he likes the arrangement, too. "My life is more interesting because l get to meet the President and skip school," he says. 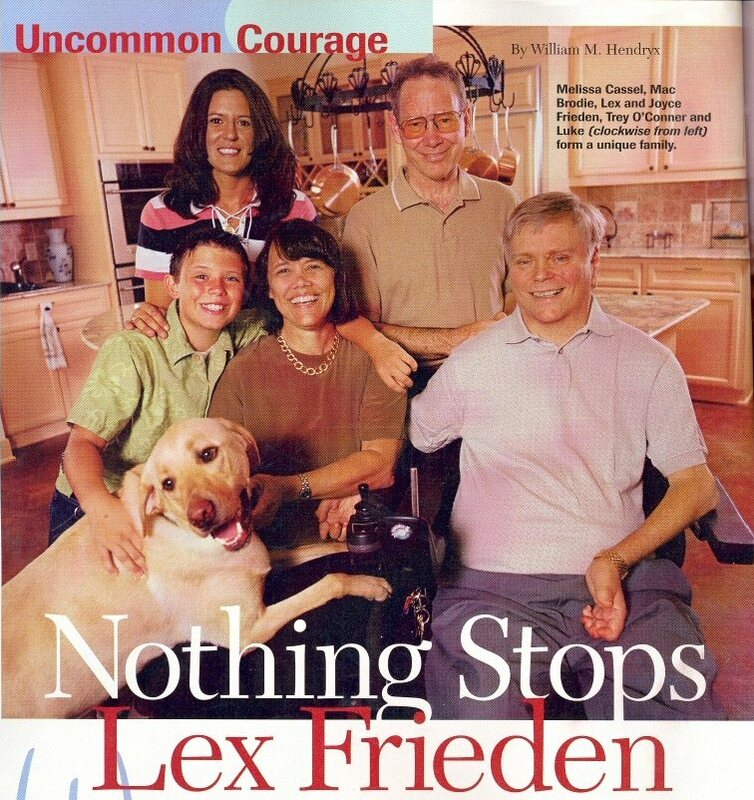 It is Lex Frieden's hope, indeed his ambition that the symbiotic relationship between him, Joyce and Mac will someday serve as a template for all people with disabilities who would like to live this way. "We want the same opportunities enjoyed by everyone else," Lex says. "We want to choose how and where to live, and we want to live with minimal reliance on others." His tone has no trace of defiance or resentment. "Some people have a way of casting aside the disabled, of expecting less of us." he says, recalling the early days after his accident. "The truth is we're no different from anyone else. We don't feel bad about ourselves. We are happy, we love to have fun, and we’re eager to accomplish things." Those initial moments of being "cast aside" were more traumatic than the accident itself, says Lex. After he first recovered, Lex entered rehabilitation at the TIRR center in Houston. There he learned about the tools of his new world—such as wheelchairs and catheters—and how to exercise, attend a movie or a baseball game, or go to a restaurant when you have wheels for legs. To Lex, who has a lifelong love affair with learning, it was just another obstacle, a problem to solve. "What some see as intimidating, I see as a puzzle, a curiosity, something to learn." says Lex. Through it all, he never felt sorry for himself, and he never felt restricted by his disability. At least, not until he decided to go back to college. "I knew that no matter what, I could go to school, and I could learn," says Lex. "Nothing could take that away from me." But when Lex, who had a straight-A transcript, applied to Oral Roberts University in Oklahoma the summer after his accident, he was denied admission because he used a wheelchair. "I was shattered." says Lex. "Breaking my neck was nothing compared to that. I had a future until I talked to the director of admissions at that school. I cannot describe the sensation of being discriminated against because of nothing more than a physical characteristic." He credits his father for coming to the rescue. As a former Naval officer and head of an independent utility company, Lex's father knew many influential people around the state. One of them was Harry Carter, then dean of students at the University of Tulsa. When Lex and his father visited the campus, the dean had to meet them in the parking lot because only one building—the newly constructed psychology building—had wheelchair access. The dean listened to their story, then responded with the wisdom of Solomon. "Just tell us what classes you want to take, and we'll hold them in that building." he said. Lex beams as he relates that story. "It was so simple!" he says. That sort of uncluttered logic is the very back-bone of how Lex applies his keen mind, principles and boundless energy in advocating a better world for people with disabilities. Since completing his education, he has become a professor of physical medicine and rehabilitation at Baylor College of Medicine in Houston, and is a senior vice president at TIRR, the rehab center where he first received the therapy and skills necessary to move on with his life. He also gives much of his energy to ILRU, where the skills for independent living are passed on through some 400 independent living centers around the country. Fundamental to this organization is the notion of peer support, that people with disabilities know better than anyone what they themselves need in order to live a full, complete and independent life. "We want to empower those with disabilities, not just 'help' them." says Lex. "By empowering them, they learn to help themselves." In recognition of all Lex has done and wants to do, President Bush named him chairman of the National Council on Disability in the fall of 2002. Chief of Staff Andrew Card swore him in at the Oval Office, with the President, Joyce, Mac and Trey as witnesses. Lex hopes to bring a rational view to those who make decisions about spending money on rehabilitation. "With all the cutbacks in health-care budgets," he says, "we're taking shortcuts in rehab therapy that will cost more later. In cutting the length of stay in rehab, we're effectively in­suring that graduates of these programs won't be fully equipped to manage self-care, get jobs and live on their own. They'll end up back in the system again and again." Contributing editor William M. Hendryx is based in Dallas. Copyright (c) 2004 by William M. Hendryx. Used with permission of the author and the publisher.